The traditional school structure is not adequately serving student learning needs and personalizing alone is not enough. A systemic renovation at all levels (district, building, AND classroom) is critical for an authentic customized learning experience. 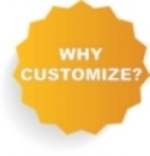 Learn about TIE's comprehensive approach for Customized Learning. Contact us today! A blended learning opportunity (with face-to-face workshops and online classes) for the changing roles of educators. A shift from an industrial model requires innovative district planning to remove barriers, enabling a customized, learner-centered environment. Educator collaboration is crucial for molding curriculum, instruction, and assessment for a customized learning experience.